He listens to the radio everywhere he goes. 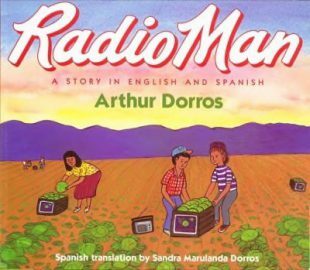 They call him “Radio Man,” or “Don Radio.” Diego and his family are migrant farm workers who move from state to state looking for work picking fruits and vegetables. His travels may bring him to different places and people, but wherever Diego journeys, his radio goes with him. The radio voices remind him of the places he’s been, help him learn about the places he’s going, and keep him in touch with the people he meets along the way. As a child, besides listening to the radio on car trips, each station along the way chiming in with its own distinctive tones and voices, I listened to the radio at night in bed. I could journey with the radio, or I could journey with books. I read books almost every night, too. I had to keep that kind of a secret, because my parents thought I was sleeping. So I couldn’t turn on the lights. When it got too dark to see the pages, or the flashlight batteries ran out, I’d duck under the covers with a radio I’d built from a few pieces in a kit. Most nights the radio only received one station, which broadcast baseball games. But every once in awhile I’d find a station whose radio waves were bouncing through the night from far off, from other parts of the country, even of the world-those were the best nights. During the days, I liked growing things. I got seeds, planted gardens and worked in them, watering and pulling the weeds. Okay, so I didn’t pull so many weeds, but I did grow gardens. When I started working at jobs, I thought that because I liked growing things I would look for work with plants. One summer I worked on a farm in Wisconsin. Helping with a harvest was the hardest work I’d ever experienced, even harder than the construction work I’d done. Hunched over all day, harvesting plants then stacking them, was difficult, heavy, and uncomfortable work-both the positions, the lifting, and the hot, hot sun beating down on us all day. Another summer I went to pick fruit in eastern Washington State. Again it was hot, heavy work, but this time I was moving in a different direction. Instead of bending over all day, I was climbing ladders and stretching, then lugging fruit-filled bags down the ladder to empty into a bin. I noticed that some of the people around me could pick twice or three times as much as I could in the same amount of time. In the evenings, around the little houses we were staying in on the farm, I got to know some of the other fruit pickers. They knew the work well. They were migrant farm workers who traveled from farm to farm, some with their families, as they worked with different crops. Early one morning, about fifteen years after I’d worked picking fruit, I was driving over the mountains from Seattle to speak at a school in Eastern Washington. Suddenly as I tuned the radio, I heard an announcer speaking Spanish in some parts of the broadcast and English in others. “Ricardo, feliz cumpleaños.” “Emily, your cousin will be arriving next Thursday.” It turned out to be a radio station especially for farm workers, and the announcements helped people keep in touch with each other. A new story idea was born for me at that moment, and I couldn’t wait to start scrawling notes on any piece of paper I could find.